ART TAIPEI 2017 浅井忠 石川欽一郎 山田啓貴 山本雄教 | 心と眼を大切にする至峰堂画廊"
At Shihodo Gallery, our prime value is to ‘cherish the eye and mind’. We take pride in introducing art with timeless value, centred around artists from modern and contemporary eras. Art has the power to let us experience -regardless of time and place- the times surrounding and the subtlest movements of a person, whether that person may have no known name. At the same time art also gives us numerous views, dialogue, excitement and richness of life. With those thoughts at heart, and taking into account historical context, we never cease to thoroughly assess the quality and raison d’etre of the art we introduce to you. In this age overwhelmed by the importance of context, ideas and marketability, we most highly value whether, regardless of changes in times and social economics, our art has the quality to maintain its power as art. On the basis of these ideals, we present to you Keiki Yamada, Yukyo Yamamoto, Chu Asai and Kinichiro Ishikawa. Chu Asai held a pivotal role in the uprise of western art in Japan, otherwise known as yoga. As an educator he successfully nurtured the talents of many to come such as Ryuzaburo Umehara, but Asai’s work itself has outstanding freshness. His unwavering dignity and sophistication, characteristic of one living in the socioeconomic circumstances of the late nineteenth century, still take us viewers to exhilarating realms more than a hundred years on. In aspects of both historical importance and qualitative achievement (two pieces are officially protected as Important Cultural Property in Japan), we believe Asai ia an artist who will continue to be revalued throughout the ages. After vigorous interpretation of numerous western documents on watercolour in his early years, Ishikawa achieved a style which was unwaveringly Eastern. A pioneer in the establishment and deepening of watercolour painting in the Eastern world, he became a giant of the Taiwanese artscene in the early twentieth century. His artwork, most of which is watercolour, still delights viewers with its lustrous qualities. survived since the middle ages, Yamada paints subjects that the modern-day artist treasures. In our age where the relationship between artist, existence of the subject and the perceiver are said to have changed dramatically, Yamada is able to create a unique atmosphere for dialogue through sheer quality. With his art, he urges us to perceive the importance of his recurring themes, such as the existence of subjects that go unnoticed in day-to-day life, and recollection of our own long-lost memories. 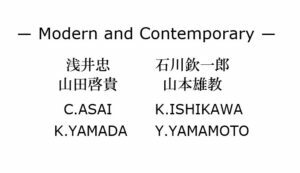 By sincerely presenting us with the perpetual meaning and joy of art, Yamada’s work questions us head-on about the ambiguity of the definition of contemporary art. Through his technique of coin rubbing with manila paper and pencil, Yamamoto expresses the broad and universal themes of the relation between his subjects -banknotes, people and globally renowned paintings- and coins. This is an ambitious experiment by him in attempt to find out just how far coins in your pocket can lead to the universe. Underlying is the ancient Japanese view on the world and nature, that ‘if you own a single leaf, you can own the entire universe’. At a glance, Yamamoto’s work may seem to hide behind its concept, but on the contrary we can feel the subtle humor and charm of the artist who he himself plays and at times is played by the relativity of value. By making the personality of the artist visible in his work, Yamamoto makes the hefty and serious underlying themes more approachable and enjoyable, and continues to produce a vast range of art with timeless and borderless appeal.